You will be given a Free reference e-book to read which has 372 pages And the test will be based on that e-book. Oracle SOA which stands for Service Oriented Architecture works effectively in transforming the somewhat complex process of integrating applications into Agile into a simpler process. It takes advantage of reusable connectivity based on service by effectively managing, routing and mediating interactions between applications and services within the Cloud or a specific enterprise. It should be noted that the specific requirements designed to integrate applications have expanded dramatically so you can expect these to include support for event processing, B2B integration, business rules, business activity monitoring and a lot more. It is also important for you to note that in order for a business organization to continuously survive, it needs to use a more unified development, monitoring, management interface and runtime across various components. Since Oracle SOA offers a more unified approach through its single interface, it is no longer surprising why it is highly recommended for the present and future requirements linked to integration. It also works in reducing risks, responding quickly to requirements of your business, reducing the cost associated to ownership and speeding time linked to marketing. 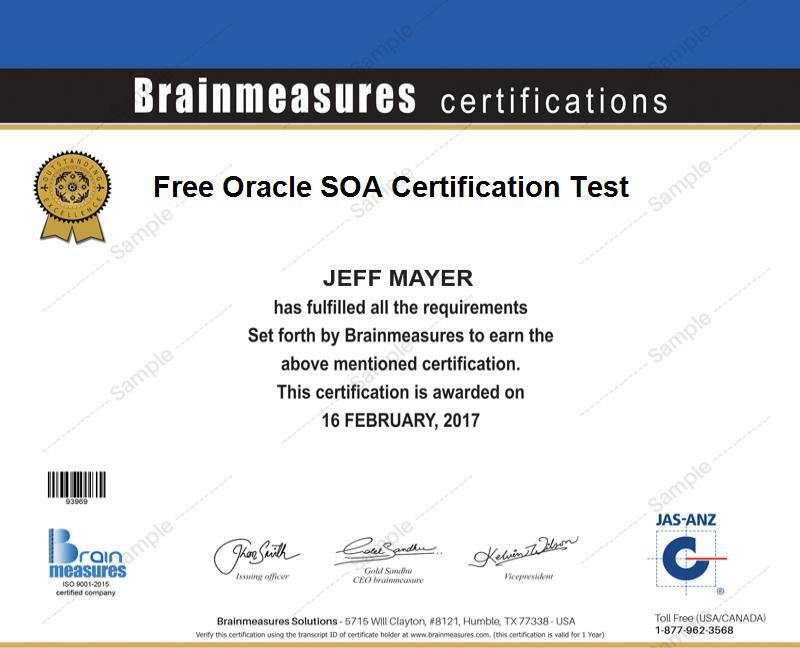 If you want to fully understand Oracle SOA, then be aware that Brainmeasures now provides a free Oracle SOA practice course. This practice course offered by the leading online certification provider is proven to be really impressive because it comes with a free study guide that discusses extensively all aspects related to using Oracle SOA. A free practice test is also offered which is extremely beneficial for you if you want to handle the actual certification exam well. The free Oracle SOA certification practice course available at Brainmeasures is proven to be really useful for you if fully understanding the service oriented architecture of Oracle has been included in your major objectives. This free Oracle practice course is proven to help you generate a stronger background about every aspect linked to Oracle SOA including the basic steps that you need to follow for the effective Oracle SOA infrastructure implementation. This free practice course features a comprehensive study guide which contains the most relevant and accurate information about Oracle SOA. You can also access a free practice test upon deciding to enrol in the practice course and this is a huge help if you plan to get an idea about how the actual certification exam works. This makes it easier for you to establish a good plan that will lead you towards passing the exam and become a certified Oracle SOA expert. How to effectively orchestrate services with the help of BPEL? The free Oracle SOA practice certification course which is introduced by Brainmeasures is a major help for all those who wish to understand the specific topics covered by the certification exam so they can easily pass it. It is a major help for all aspiring developers, programmers, consultants, administrators, technicians and other IT professionals who plan to start using Oracle SOA. Passing the Oracle SOA certification exam also boosts your chances of receiving an even bigger salary. It gives you the opportunity to work as an Oracle SOA manager which offers a salary of around $74,000 to $138,000 yearly. You can also work as an Oracle SOA developer so you can start enjoying an annual salary within the usual range of $84,000 to $151,000.